I remember September 8th, 2001 - looking for houses in New Jersey. We were about to move from Georgia to New Jersey, we had a 1-year-old, and we were expecting another child. My wife stayed home while I traveled to New Jersey with a video camera to tape potential houses. The realtor wanted to show off the area in New Jersey and took me to a point on the Jersey coast. Across the water was a magnificent view of Manhattan, with the Twin Towers rising on the south end. The sight was powerful and inspiring. Not especially beautiful, but awesome and iconic. And seemingly eternal. I remember waking up the morning of September 11th, 2001 in a hotel in San Jose. I didn't turn on the television or radio until I got into the car for the short drive to the office. Then I heard that two planes had hit the World Trade Center. I thought that they must have been small private planes. I had flown in from Atlanta the day before, and I was the first person in the office that morning (being on East Coast time). I hooked up my computer and searched around until I found a relatively good quality feed from a news organization. There were two towers - the towers I had been gazing at days before - burning. I could hear the commentator talking about the planes and reality slowly started creeping into my consciousness. I went to find a television. In a conference room across the hall, I found an old TV with rabbit ears and turned it on. Every channel had the same image. The reception was poor and there was no sound, but the images came through loud and clear. I remember calling my wife. She and her mother were preparing our home in Atlanta for its initial open house for realtors. They had been so busy cleaning and straightening that they hadn't turned on the television. I asked her to turn it on and sat on the phone with her as we both watched the carnage unfold for a few minutes. The full impact hadn't yet hit us. I don't recall either of us wondering if anyone we knew was there. I don't recall her being worried about me flying home later in the week. I remember shock and I remember wishing that I was home with my family and I remember thinking that this would all be over quickly just like the previous Trade Center bombings. I was wrong. No one showed up for the open house. I went back to watching on the computer, where commentators filled me in on what was going on. Suddenly there was a plume of smoke and the view disappeared. The commenter guessed that there had been some sort of explosion. Dust was everywhere. No one knew what was going on. It was many long minutes before someone suggested that a tower was gone. That's just not possible. The plane hit the top of the tower, not the bottom. Maybe a few floors would be destroyed, but the tower would remain. Nothing that big could possibly fall that easily. That was the first of many times that I remember praying on that day. And yet, still, the impact had not fully hit. I was in the office that morning to meet a friend - Kent -whom I was recommending to our CEO - Hemant - as a new Sales VP. Kent, Hemant, and I went into another room for the interview, thinking that the worst was certainly over. I think the interview went well (we hired Kent), but I really don't remember. What I remember is coming out of the interview room and being stopped by our CTO - Partha - who told us that both towers were gone. That just can't be true. The tower was only burning on the very top. How could that possibly cause the entire structure to collapse? It was inconceivable in a way that cannot be described to anyone who will view September 11th as history. I will never be able to truly explain that feeling to my children. I imagine that I will never feel it again. I will never again believe in the permanence of human accomplishments in the way that I did before that day. I remember the rumors that started flying. There were 10 airplanes highjacked. There were explosions in Washington, DC. There were missing flights all over the country. There were 10,000 people dead in New York alone. The highjackers had managed to take over planes with just knives. Knives? Destroying thousands of lives with knives? We thought about it for a while and realized that we probably wouldn't have rushed the highjackers either. The idea of piloting a plane into a building was completely unthinkable. Highjackers land the plane somewhere and submit demands. They don't commit suicide and take everyone else with them. But we all agreed that knives would never again be a successful way to take over a plane. No American would ever again believe a highjacker who said that he planned to land the plane. We would all put our own lives in jeopardy against any such future attack. And this was all before we'd even heard the heroism aboard about United Flight 93. I remember getting a call from a friend - Hal - who knew that I had been in New Jersey a few days before and was scheduled to fly into San Francisco this week. He was worried that I had taken American Flight 11. I assured him that I was ok, we exchanged some horrified banter, and I hung up. And only then did I start thinking that maybe, just maybe, someone that I knew was in the rubble of the Trade Centers in lower Manhattan. I have friends in NYC, and I was about to start working for a company based just across the water. Later I learned of the close calls and family tragedies. Of the co-worker whose sister-in-law, who was the visa holder for a hard-working immigrant family, never made it down from the 88th floor. Of the neighbor on his first visit to New York who managed to get onto the Staten Island Ferry just as the tower collapsed. Of the assistant whose policeman husband went to Ground Zero in the following days and returned with pictures and stories and a haunted look. And of the good friend whose buddy had just started his dream job with the Port Authority, who had rushed to the Towers to help out, and who never came out again. I remember bits and pieces of that week spent on the West Coast. I remember sitting up very late on September 11th and finally pulling out my journal and writing in it for the first time in many weeks. I remember thinking that I could not imagine recovering from this day, even though I knew in my head that recovery would happen. Our office was next to the airport, and I very distinctly remember the skies being deathly quiet. I remember looking up often, expecting to see an airplane somewhere and realizing how ingrained the sound of jets in the stratosphere is in modern life. I remember starting to worry about how I was going to get home. And I remember feeling guilty for being worried about something so trivial. I remember that not a lot of work was done that week. I remember being taken to dinner on the top of a restaurant in San Francisco on the night that some commercial planes were finally allowed to start flying again. When the first plane flew in over the restaurant, the patrons rushed to the windows. And they applauded a FedEx airplane as it winged its way over San Francisco on a flight that would have been trivial only days before. I had flown to California from Atlanta on American Airlines and was scheduled to return on Friday. American could not guarantee that I would get any closed than Dallas, Texas. Our CEO - Rao - personally contacted his travel agent to see if they could find a way to get me back to Atlanta. The agent told me to go back to my hotel and pack everything and be ready to leave at any moment. That was Thursday morning. Agent: Can you be in Oakland in 40 minutes? Me (in San Jose): No. Agent: OK. I'll call you back. Late that afternoon came the call that I certainly never expected. I had a flight on Vanguard Air, through Kansas City, to Atlanta on Friday. I would get back home only a few hours later than originally scheduled. I couldn't believe my luck and, again, felt guilty for all of the others who would not be so lucky. I remember San Francisco International Airport on that Friday morning. The line for United Airlines was outside of the building and off into the distance farther than I could see. There were armed police and military every few feet. There were dogs sniffing all of the luggage. There were airport employees shouting instructions and warnings about what could and could not be taken onto the planes. Even the smaller airlines had lines down the length of the terminal. And everyone - everyone - was unfailingly polite and calm and understanding in a way that will probably never be seen again at SFO. My airline - Vanguard - had only one flight out that day, so everyone in line knew that we were going to get on the flight. That was good thing because every bag was opened, every bag was screened, and every person was closely inspected. The process was long, but bearable in the Vanguard line. In the United line, I imagine the wait was excruciating. Our IDs were checked at least 3 times that day by a staff who very obviously was taking their task seriously. This was nothing like the checks that are done today, which seem quite cursory by comparison. And absolutely no one complained or argued about the inconvenience. While waiting to board the plane, an announcement was made that a moment of silence would be held in memory of those who had lost their lives earlier in the week. This was very emotional for many of the airline employees, as many had lost friends an acquaintances on that day. Just before the moment of silence was to start, some idiot called in a bomb threat. There is not a level of hell deep enough or hot enough for the type of scum who would call in a bomb threat in that situation. One flight attendant near me broke down into tears, crying "why couldn't they at least let us have our moment of silence." If we had been able to identify the caller, there are very few in that airport who would have been able to remember that we are a civilized society based on a rule of law. That was the first moment that I can remember being truly angry about what happened on September 11th. In the coming weeks and months, the pain and sorrow still comes back in force on occasion. The anger lingers constantly just below the surface. There were two bomb threats in San Francisco and another when we landed in Kansas City. That experience can really bruise your image of America and its citizens. The flights that day were nearly empty, but everyone on board was quickly a bosom companion of everyone else. The woman in the row behind me was a radio reporter, carrying her tape recorder and interviewing everyone she saw, who hadn't slept in over 24 hours. The people beside me opened up their lives in raw, emotional ways that would seem wholly inappropriate now. The flight attendants were amazingly professional, and everyone actually listened when they spoke. Then some jerk about 3 rows up, when told to buckle his seatbelt replied, "What difference does it make if there's a bomb on board?" The attendant's eyes teared up and she had to walk away. The other passengers in the row let the miscreant know in short order that he was expected to be seen and not heard for the remainder of the flight. It may have been a coping mechanism, and he may have been just as scarred inside as we all were, but at that moment many on the plane were ready to leave him behind in San Francisco. I remember donating money to the Red Cross. I remember seeing photos of people worldwide donating blood. I remember the charities reporting record amounts of giving. I remember the video of Palestinians celebrating in the streets and thinking that a cruise missile was justified. I remember eBay setting up auctions with the proceeds going to charity. I remember people buying and selling the same coins over and over again so that more contributions would be generated. I remember watching the musical tribute on television. I remember an ash-covered and dented FDNY helmet sitting on a piano as Billy Joel played. I remember not being able to stop the tears that were trickling out of my eyes. Not sobbing, not weeping, just pain leaking out uncontrollably. I remember a few months later watching the documentary "9/11", filmed in New York and inside the towers as they fell. I remember the unedited sounds of bodies hitting the ground. It brought back memories of the video and pictures - not often shown anymore - of people standing on ledges waiting futilely for help. I tried to imagine how horrible it must have been to consciously take that step into oblivion from 90 stories above the street ... and to wait for long moments falling through the air. And I cried again. I remember just a few weeks ago when the documents from the trial were made public and I browsed through and ended up listening to a cell phone call that captured the last, horrific screams of a man who died in the towers. I remember that cry even now, at unexpected times, and it stops my breathing and churns my gut and closes my throat. I pray that my children will never feel this. That 9/11 will be to them what Pearl Harbor was to me - a horrible tragedy that happened in the past and has no hold on their lives today. 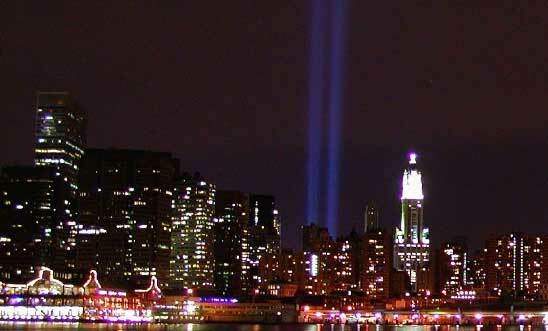 I remember 2,996 innocents who lost their lives 5 years ago today. Great post. The details of that day will never fade. Every single year is just as clear as when it happened. Thank you. That was a wonderful post. I enjoyed reading your memories.